Greek yard SSH Maritime has completed a three-month €4,000,000 refit on the explorer yacht Aspire, which included a three metre extension. 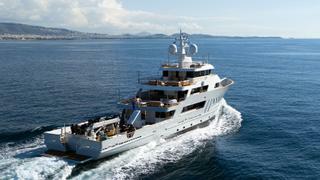 Previously named Etra, the now 51 metre superyacht was ripe for a refit, having been originally delivered in 2006. Work began in August last year and included a wide catalogue of works, including the refitting of all exterior and interior spaces, full hull and superstructure repainting and teak replacement. The interior overhaul saw the saloon and all cabins refreshed with new fabrics and upholstery. Built from a steel hull, Aspire has a 10 metre beam and three metre draft. Accommodation is for a total of 12 guests in six staterooms, comprising five guest cabins and an owner’s suite. 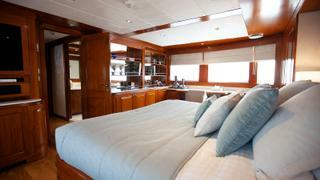 The master suite sits on the upper deck and includes a private study, walk-in closets and his and her ensuite baths. The guest rooms meanwhile sit on the main deck. Aspire’s crew quarters meanwhile allow for a staff of 11 in four crew cabins and one captain cabin. 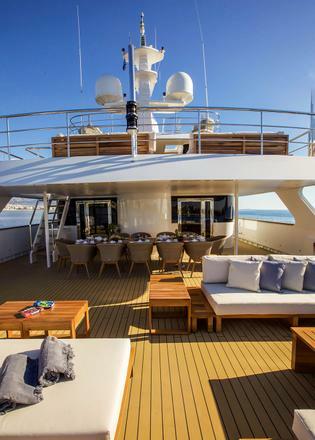 Other features include a Jacuzzi and alfresco dining area on the sky lounge aft. The sundeck meanwhile has been designed as a wellness area, with the aft deck space intended for yoga and exercise classes. Power comes from two Caterpillar 1050 HP diesel engines for a top speed of 14.4 knots. Aspire is now offered for sale, with an asking price of €10,900,000.